Jazz Up Your Revenue Cycle With the Right Patient Payment Solution at the AOA-36 Conference! Hey to all our otolaryngology friends! Time to get ready to chow down on some sweet and crispy beignets, spice things up with a few Cajun delicacies and… learn how to optimize your revenue cycle? Those things might not normally go together, but this coming weekend they do! 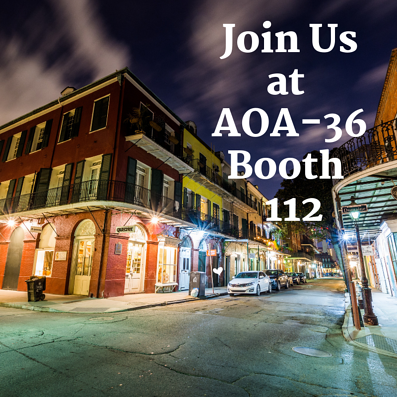 That’s because Health iPASS is headed out to “The Big Easy” for the 2018 AOA-36 Annual Educational Conference September 12-15 in beautiful New Orleans, Louisiana. We hope to connect with all of you and show you how you can increase operating income, decrease time and cost to collect, and even build engagement and trust with your patients using the Health iPASS patient revenue cycle solution. This year’s conference promises to be a good one featuring a keynote presentation entitled “The Promise” by renowned speaker Jason Hewlett that is rumored to be both informative and actually lol-worthy. I’m intrigued, how about you? If you’re looking to jazz up your weekend, head on over to booth 112 to meet Corbin from the Health iPASS sales team. While you’re at it, schedule a demo of the Health iPASS patient revenue cycle solution and check out how we’ve been able to provide some serious ROI for our current clients who are enjoying 90-95% collection rates and a 50% reduction in claims denials. Additionally, as part of our corporate social responsibility initiative, for every demo performed during the 2018 trade show and convention season, we will donate $25 to the Greater Chicago Food Depository. Ca c'est bon! With the changing healthcare landscape, patients expect price transparency, clear and timely payment methods, plus easy and convenient check-in and appointment management system. Talk to us and find out why Health iPASS is the right solution for your patient revenue cycle management. Also, can you save us a few of those beignets? Those things are gosh darn delicious. Even if you are just there to enjoy the sights and sounds and tastes of NOLA, feel free to stop by and drop your business card off for a chance to win an Amazon Alexa. See you there!